RealEstateAgent.com allows User/clients to locate and evaluate proposals from independent third party real estate professionals. User/clients (whether a home buyer or a home seller) agree to supply RealEstateAgent.com with information about themselves and the property they want to sell or hope to buy. RealEstateAgent.com will use this information within RealEstateAgent.com and will provide certain details on an anonymous or non-anonymous basis depending on the RealEstateAgent.com service to third parties who are, in most cases, appropriate members of its real estate agent network. User/clients may also agree to have the information he/she has supplied to RealEstateAgent.com forwarded to real estate or other third-party professionals referred by RealEstateAgent.com. As RealEstateAgent.com uses e mail , on an almost exclusive basis, to provide RealEstateAgent.com services, all RealEstateAgent.com user/clients must consent to receive E mail from RealEstateAgent.com to register for RealEstateAgent.com services. RealEstateAgent.com user/clients will also be required to consent to receive e mail s from third party(ies) if the RealEstateAgent.com service requested requires services from a third party(ies)(for example, a local real estate agent). To assure the value of RealEstateAgent.com's services, you agree that all of the information you have provided to RealEstateAgent.com, whether online or otherwise, is accurate and complete. RealEstateAgent.com reserves its right to terminate or suspend access to any user/client information that is alleged to be inaccurate or misleading. If required by the terms of the RealEstateAgent.com service requested by User/client, you authorize RealEstateAgent.com to forward your information to its network of real estate professionals according to the terms and conditions of the RealEstateAgent.com services that you use. RealEstateAgent.com may refer real estate professionals to User/clients, but RealEstateAgent.com does not engage in real estate broker services. Real Estate brokerage activities are performed by local Real Estate Professionals that have been referred to you by RealEstateAgent.com. The terms of any agreement between a real estate professional and RealEstateAgent.com are not endorsed, recommended or otherwise known to or by RealEstateAgent.com. RealEstateAgent.com may from time to time offer eligible User/clients and Registered Clients promotional opportunities to incent use of RealEstateAgent.com's services within a particular time frame. These opportunities may include but are not limited to discounts, rebates, gift certificates, or other incentives that are only available to User/clients who use a RealEstateAgent.com affiliated real estate professional to buy or sell a home. User/client eligibly for a particular promotion will be defined in the terms of each promotion. Not all User/clients may be eligible to receive all promotional opportunities. RealEstateAgent.com promotional offers are subject to change without notice to the user/client. First time user/clients may be entitled to promotional offers that will expire after the Billing Plan deadline user/client acknowledges that promotional rate will expire at billing plan deadline and renewals are billed at regular rates. User/client acknowledges that upon expiration of the billing plan chosen, this agreement will be automatically renewed for the time period specified during initial contract. From time to time RealEstateAgent.com may include on its www.RealEstateAgent.com.com site, third party services such as a Moving Center or a Home Improvement Center. RealEstateAgent.com posts these services on its site as a service to its User/clients who may be interested in such services. RealEstateAgent.com is not responsible for and makes no warranty or representation as to the quality or performance of the services offered. RealEstateAgent.com advises all user/clients to review carefully each third party service offering prior to engagement with any third party service provider. You understand and agree that the Real Estate Professionals and others in the real estate field who appear on the RealEstateAgent.com website or who may be referred by RealEstateAgent.com are not employed by RealEstateAgent.com. RealEstateAgent.com is not responsible or liable for any acts or omissions created or performed by these third parties. RealEstateAgent.com's Web site may contain links to Web sites maintained by third parties. Such links are provided for your convenience and reference only. RealEstateAgent.com does not operate or control in any respect any information, software, products or services available on such Web sites. RealEstateAgent.com's inclusion of a link to a Web site does not imply any endorsement of the services or the site, its contents, or its sponsoring organization. 4.8You acknowledge that RealEstateAgent.com recommends your independent use of all appropriate government, public, consumer and other agencies or sources to verify a Real Estate Professional's license status and background as RealEstateAgent.com, makes no representations and/or warranties about any Real Estate Professional that may use the RealEstateAgent.com service. 4.9As a Home Buyer or Seller, you are not bound to accept any of the Proposals submitted. Proposals are not binding offers and are not intended to create a contractual or agency relationship between you and the real estate professional. 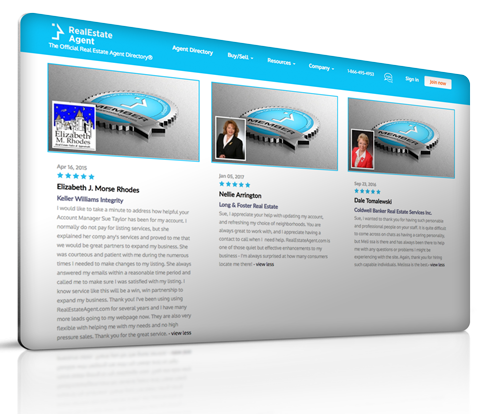 Any endorsements posted by a Real Estate Professional through the RealEstateAgent.com Consumer Feedback Program are the sole responsibility of the Real Estate Professionals. RealEstateAgent.com disclaims any liability arising from and the accuracy of any Endorsements posted by Real Estate Professionals. It is your responsibility to evaluate the nature of any Endorsement posted by any Real Estate Professional and to be aware that Endorsements might not reflect the actual quality of service that you may receive from a Real Estate Professional. 5.1 General. RealEstateAgent.com bills you through an online account (your "Billing Account") for use of the Service. You agree to pay RealEstateAgent.com all charges at the prices then in effect for any use of the Service by you or other persons (including your agents) using your Billing Account, and you authorize RealEstateAgent.com to charge your chosen payment provider (your "Payment Method") for the Service. You agree to make payment using that selected Payment Method. RealEstateAgent.com reserves the right to correct any errors or mistakes that it makes even if it has already requested or received payment. 5.2 Recurring Billing.Most subscription plans to the Service consist of an initial period, for which there is a one time charge, followed by recurring period charges as agreed to by you. By entering into this Agreement, you acknowledge that your subscription has an initial and recurring payment feature and you accept responsibility for all recurring charges prior to cancellation, which is required to be received by office no later than 10 days prior to next payment due date.. RealEstateAgent.com MAY SUBMIT PERIODIC CHARGES (E.G., MONTHLY, QUATERLY, SEMI-ANNUAL, AND ANNUAL) WITHOUT FURTHER AUTHORIZATION FROM YOU, UNTIL YOU PROVIDE PRIOR NOTICE (CONFIRMED IN WRITING UPON REQUEST BY RealEstateAgent.com) THAT YOU HAVE TERMINATED THIS AUTHORIZATION OR WISH TO CHANGE YOUR PAYMENT METHOD. SUCH NOTICE WILL NOT AFFECT CHARGES SUBMITTED BEFORE RealEstateAgent.com REASONABLY COULD ACT. 5.3 Current Information Required.YOU MUST PROVIDE CURRENT, COMPLETE AND ACCURATE INFORMATION FOR YOUR BILLING ACCOUNT. YOU MUST PROMPTLY UPDATE ALL INFORMATION TO KEEP YOUR BILLING ACCOUNT CURRENT, COMPLETE AND ACCURATE (SUCH AS A CHANGE IN BILLING ADDRESS, CREDIT CARD NUMBER, OR CREDIT CARD EXPIRATION DATE), AND YOU MUST PROMPTLY NOTIFY RealEstateAgent.com IF YOUR PAYMENT METHOD IS CANCELED (E.G., FOR LOSS OR THEFT) OR IF YOU BECOME AWARE OF A POTENTIAL BREACH OF SECURITY, SUCH AS THE UNAUTHORIZED DISCLOSURE OR USE OF YOUR USER NAME OR PASSWORD. IF YOU FAIL TO PROVIDE RealEstateAgent.com ANY OF THE FOREGOING INFORMATION, YOU AGREE THAT RealEstateAgent.com MAY CONTINUE CHARGING YOU FOR ANY USE OF THE SERVICE UNDER YOUR BILLING ACCOUNT UNLESS YOU HAVE TERMINATED YOUR SUBSCRIPTION FOR THE SERVICE (CONFIRMED BY YOU IN WRITING UPON REQUEST BY RealEstateAgent.com). 5.4 Payment Method. For its services RealEstateAgent.com will receive payment including, but not limited to a credit card, money order check, e check, catchers check, certified check, Visa, Master Card, American Express, and Discover. RealEstateAgent.com's payment is due based on an agreement between RealEstateAgent.com and the real estate professional involved. Your registration with RealEstateAgent.com and use of RealEstateAgent.com services constitutes your acknowledgment of, and agreement to, this compensation arrangement. The terms of your payment will be based on your Payment Method and may be determined by agreements between you and the financial institution, credit card issuer or other provider of your chosen Payment Method (the "Payment Method Provider"). If RealEstateAgent.com does not receive payment from your Payment Method Provider, you agree to pay all amounts due on your Billing Account upon demand. 5.5 Change in Amount Authorized.If the amount to be charged to your Billing Account varies from the amount you preauthorized (other than due to the imposition or change in the amount of state sales taxes), you have the right to receive, and RealEstateAgent.com shall provide, notice of the amount to be charged and the date of the charge at least 10 days before the scheduled date of the transaction. Any agreement you have with your Payment Method Provider will govern your use of your Payment Method. You agree that RealEstateAgent.com may accumulate charges incurred and submit them as one or more aggregate charges during or at the end of each billing cycle. 5.6 Auto-renewal. 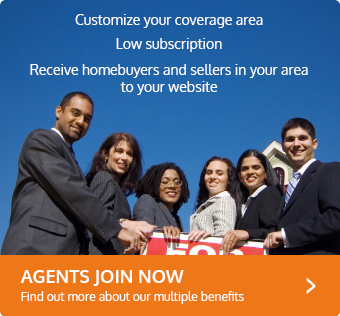 Your RealEstateAgent.com subscription will be automatically extended for successive renewal periods of the same duration as the subscription term originally selected, at the then-current non-promotional subscription rate. If you resign, you may use your subscription until the end of your then-current subscription term; your subscription will not be renewed after your then-current term expires. However, you won't be eligible for a prorated refund of any portion of the subscription fee paid for the then-current subscription period. 5.7 Reaffirmation of Authorization. Your non-termination or continued use of the Service reaffirms that RealEstateAgent.com is authorized to charge your Payment Method. RealEstateAgent.com may submit those charges for payment and you will be responsible for such charges. This does not waive RealEstateAgent.com right to seek payment directly from you. Your charges may be payable in advance, in arrears, per usage, or as otherwise described when you initially subscribed to the Service. 5.8 Promotions. Any promotion that provides subscriber-level access to the Service must be used within the specified time of the promotion. You must cancel your subscription 10 days prior to the next payment due date in order to avoid being charged a subscription fee. If you cancel prior to the end of the promotion period and are inadvertently charged for a subscription, please contact Customer Service. 5.9 Cancellation.Either party may elect to cancel this agreement at any time, providing the following: RealEstateAgent.com may elect to terminate this agreement at any time if it is deemed warranted due to payment default. RealEstateAgent.com will notify Subscriber of such intent and provide a grace period of not less than 10 days for Subscriber to have the opportunity to remedy the situation. In the event that Subscriber fails to remedy the situation within the allotted time frame, RealEstateAgent.com shall reserve the right to remove the listing created for Subscriber from the database. In the event that Subscriber wishes to terminate this agreement, the cancellation procedure must be initiated no later than 10 days prior to the end of the current term by notifying the Customer Service by phone (1-866-495-4953) or using the live chat Monday through Friday between 8:30 a.m. and 5:30 p.m. The Customer Service must assist Subscriber through the cancellation process and will send an e-mail containing a unique URL(link) that can be accessed only for 24 hours. That URL(link) will open a special cancellation page attached to Subscriber's account. If Subscriber completes the cancellation procedure, services will be discontinued at the end of the billing period. Failure to take any action will automatically prolong the contract and Subscriber will be responsible for the upcoming periodic charge and will not be entitled to a refund of any portion thereof. All contents of the RealEstateAgent.com website are Copyright © 2003-2019 Business Locate, Inc. and or its suppliers, 2700 N. State Rd. 7 Hollywood, FL. 33021. All rights reserved, RealEstateAgent.com is a trademark of Business Locate, Inc.. Other product and company names may be trade or service marks of their respective owners. USER/CLIENT EXPRESSLY UNDERSTANDS AND AGREES THAT THIS IS A FORM OF ADVERTISING, NOTWITHSTANDING THE ABOVE: YOUR USE OF AND RELIANCE UPON ANY AND ALL OF THE RealEstateAgent.com NETWORK, SERVICES AND/OR CONTENT IS AT YOUR SOLE RISK AND IS MADE AVAILABLE ON AN "AS IS" AND "AS AVAILABLE" BASIS. RealEstateAgent.com MAKES NO EXPRESS OR IMPLIED REPRESENTATIONS, WARRANTIES, REGARDING WEB SITE TRAFFIC, LEADS, E-MAILS, STATISTICS, OR GUARANTEES WITH REGARD TO THE APPROPRIATENESS, ACCURACY, SUFFICIENCY, CORRECTNESS, VERACITY, VALUE, COMPLETENESS, OR TIMELINESS OF THE RealEstateAgent.com NETWORK, SERVICES AND/OR CONTENT. RealEstateAgent.com EXPRESSLY DISCLAIMS ALL WARRANTIES OF ANY KIND, WHETHER EXPRESS OR IMPLIED, INCLUDING, BUT NOT LIMITED TO THE IMPLIED WARRANTIES OF MERCHANTABILITY, FITNESS FOR A PARTICULAR PURPOSE AND NON-INFRINGEMENT. RealEstateAgent.com intends that the information contained in its Web site be accurate and reliable; however, errors sometimes occur. In addition, RealEstateAgent.com may make changes and improvements to the information provided herein at any time. THE WEB SITE AND THE INFORMATION, SOFTWARE, PRODUCTS AND SERVICES ASSOCIATED WITH IT ARE PROVIDED "AS IS." RealEstateAgent.com AND/OR ITS SUPPLIERS, PARTICIPATING LENDERS, OR REAL ESTATE PROFESSIONALS DISCLAIM ANY WARRANTY OF ANY KIND, WHETHER EXPRESS OR IMPLIED, AS TO ANY MATTER WHATSOEVER RELATING TO THE WEB SITE AND ANY INFORMATION, SOFTWARE, PRODUCTS AND SERVICES PROVIDED HEREIN, INCLUDING WITHOUT LIMITATION THE IMPLIED WARRANTIES OF MERCHANTABILITY, FITNESS FOR A PARTICULAR PURPOSE, TITLE, AND NONINFRINGEMENT. USE OF RealEstateAgent.com'S SERVICES IS AT YOUR OWN RISK. RealEstateAgent.com AND/OR ITS SUPPLIERS, ARE NOT LIABLE FOR ANY DIRECT, INDIRECT, PUNITIVE, INCIDENTAL, SPECIAL OR CONSEQUENTIAL DAMAGES OR OTHER INJURY ARISING OUT OF OR IN ANY WAY CONNECTED WITH THE USE OF RealEstateAgent.com'S SERVICES OR WITH THE DELAY OR INABILITY TO USE THE WEB SITE, OR FOR ANY INFORMATION, SOFTWARE, PRODUCTS AND SERVICES OBTAINED THROUGH THE WEB SITE, OR OTHERWISE ARISING OUT OF THE USE OF THE WEB SITE, WHETHER RESULTING IN WHOLE OR IN PART, FROM BREACH OF CONTRACT, TORTIOUS BEHAVIOR, NEGLIGENCE, STRICT LIABILITY OR OTHERWISE, EVEN IF RealEstateAgent.com AND/OR ITS SUPPLIERS HAD BEEN ADVISED OF THE POSSIBILITY OF DAMAGES. SOME JURISDICTIONS DO NOT ALLOW THE EXCLUSION OF IMPLIED WARRANTIES, SO THE ABOVE EXCLUSION MAY NOT APPLY TO YOU. As a condition of use of this Web site, you agree to indemnify RealEstateAgent.com and its suppliers, distributors, participating Lenders, or Real Estate Professionals from and against any and all liabilities, expenses (including attorneys' fees and costs) and damages arising out of claims resulting from your use of RealEstateAgent.com's services, including without limitation any claims alleging facts that if true would constitute a breach by you of this agreement. IN NO EVENT SHALL RealEstateAgent.com BE LIABLE FOR ANY DIRECT, INDIRECT, PUNITIVE, INCIDENTAL, SPECIAL, CONSEQUENTIAL DAMAGES OR ANY DAMAGES WHATSOEVER INCLUDING, WITHOUT LIMITATION, DAMAGES FOR LOSS OF USE, DATA OR PROFITS, ARISING OUT OF OR IN ANY WAY CONNECTED WITH THE USE OR PERFORMANCE OF THE RealEstateAgent.com NETWORK, WITH THE DELAY OR INABILITY TO ACCESS OR USE THE RealEstateAgent.com NETWORK OR RELATED SERVICES, THE PROVISION OF OR FAILURE TO PROVIDE SERVICES, OR FOR ANY CONTENT, SOFTWARE, PRODUCTS AND SERVICES MADE AVAILABLE OR OBTAINED THROUGH THE RealEstateAgent.com NETWORK, OR OTHERWISE ARISING OUT OF THE USE OF THE RealEstateAgent.com NETWORK, WHETHER BASED ON CONTRACT, TORT, NEGLIGENCE, STRICT LIABILITY OR OTHERWISE, EVEN IF RealEstateAgent.com HAS BEEN ADVISED OF THE POSSIBILITY OF DAMAGES. ANY SERVICES OR CONTENT MADE AVAILABLE OR OBTAINED THROUGH THE USE OF THE RealEstateAgent.com NETWORK, AND ALL OTHER USE OF THE RealEstateAgent.com NETWORK, IS DONE AT YOUR OWN DISCRETION AND RISK AND YOU WILL BE SOLELY RESPONSIBLE FOR ANY DAMAGE TO YOUR COMPUTER SYSTEM OR LOSS OF DATA THAT RESULTS THEREFROM. IN NO EVENT SHALL RealEstateAgent.com OR RealEstateAgent.com'S SUPPLIERS BE LIABLE FOR LOST PROFITS OR ANY SPECIAL, INCIDENTAL OR CONSEQUENTIAL DAMAGES (HOWEVER ARISING, INCLUDING NEGLIGENCE) ARISING OUT OF OR IN CONNECTION WITH THIS AGREEMENT. Some states do not allow the limitation of liability, so the foregoing limitation may not always apply. RealEstateAgent.com is not responsible for any errors or delays in responding to a qualification form, or contact form caused by an incorrect e-mail address provided by you or other technical problems beyond our reasonable control. Any claim or controversy arising out of or relating to the use of RealEstateAgent.com's services, to the goods or services provided by RealEstateAgent.com, or to any acts or omissions for which you may contend RealEstateAgent.com is liable, including but not limited to any claim or controversy ("Dispute"), shall be finally, and exclusively, settled by a Court in Broward County, Florida. Under no circumstances may the venue be changed. You agree that regardless of any statute or law to the contrary, any claim or cause of action arising out of or related to use of this Site or this Agreement must be filed within one (1) year after such claim or cause of action arose or be forever barred. Should I Pay Points for a Lower Rate? How much money can I borrow to buy a home? What type of a home is a condominium? What is a seller takeback? Can I Use Two Realtors® to Sell My House?